George Bellows, A Stag at Sharkey’s, 1917. Lithograph. Private collection. It Was a New Century: Reflections on Modern America presents a fresh view of the dawn of the modern age through nearly 60 late 19th- and early 20th-century American paintings, prints, drawings, and watercolors on loan to the Yale University Art Gallery from a private collection. The new century saw the acceleration of America’s already dizzying transformation into an industrial power, which had defining effects on the nation’s art and culture. Technological innovations improved the quality of life for many—even as American cities grew larger, denser, and tougher—and artists embraced both the glamour and grittiness of urban life as a quintessentially modern subject. 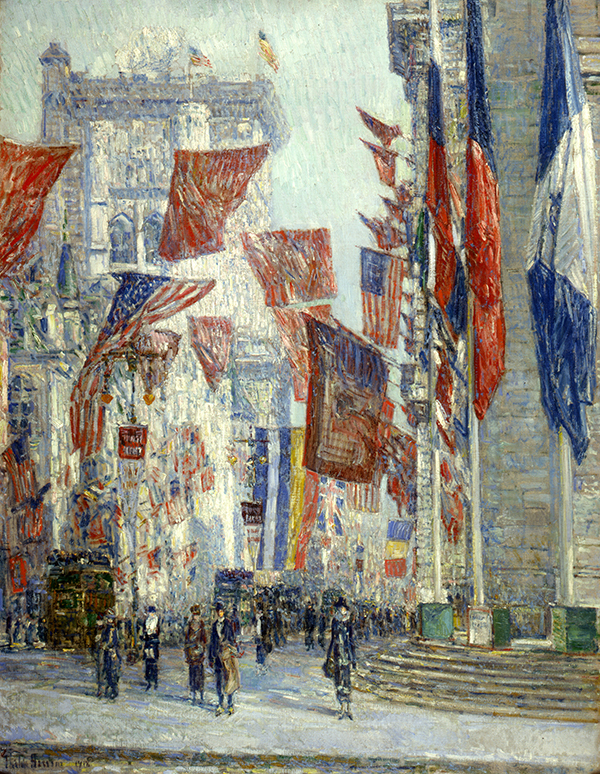 Opening with the bustling street and colorful flags of Childe Hassam’s Avenue of the Allies (1918), the exhibition is organized thematically, addressing the leading artistic ideas of the day as well as the underlying preoccupations that drove them. Social realism emerged as the primary approach to capturing the city during the early 20th century, led by the artists of the so-called Ashcan School, named for its focus on the life and urban experience of New York’s working class. In images such as Jerome Myers’s Peddlers, Lower East Side (1905), which depicts a busy sidewalk market scene, and Everett Shinn’s pastels swirling with falling snow and huddled figures rushing through Washington Square Park, the urban landscape and its inhabitants often merge into a unified expression of bustling city life. 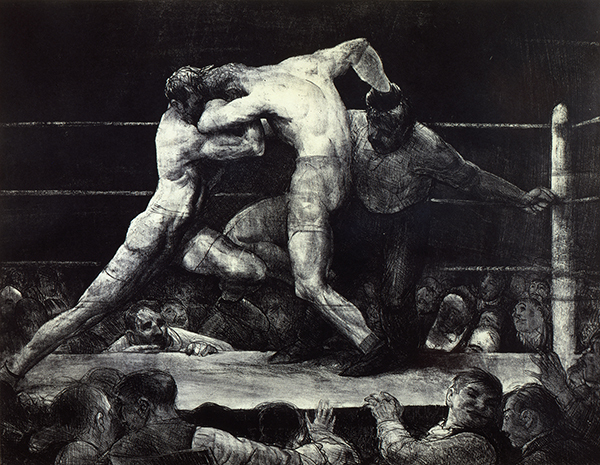 Combining spectacle, energy, and violence, George Bellows’s depictions of boxing matches are widely considered among the signature achievements of the period. A group of six lithographs in the exhibition explores the boxing theme in depth and provides a sense of the unfolding drama in the ring as well as the crowd. Bellows’s 1917 lithograph A Stag at Sharkey’s—based on a 1909 painting of the same title—contributed to the public debate about the propriety of boxing and is one of the most venerated artworks he ever produced. Sharkey’s Athletic Club, a bar across from Bellows’s New York studio, hosted illegal “stag” prizefights for all-male audiences. Bellows portrays a fleeting moment of dynamic equilibrium between the two boxers before the match is won or lost. Individual humanity was expressed through portraiture, another key genre of the period. Though the eponymous subject of Walt Kuhn’s Clown in a Beaver Hat (1944) is painted in full makeup, the sitter’s own character is powerfully evident in his intense expression. Works by Kuhn and others poignantly convey depth, as these artists looked past the artificiality of the costume to capture the self-awareness of the actors. Leisure was also a prominent theme of the time, both in and out of the city. Parks, beaches, and the countryside offered reprieves from the demands of urban life, and artists including William Merritt Chase, William Glackens, and Maurice Prendergast made recreation a primary subject, bathing their scenes in bright sunlight and shimmering colors that call to mind vacations long past. Influenced by the virtuosic paint handling and attention to light of the French Impressionists and Postimpressionists, these artists adapted that vocabulary to the American landscape. 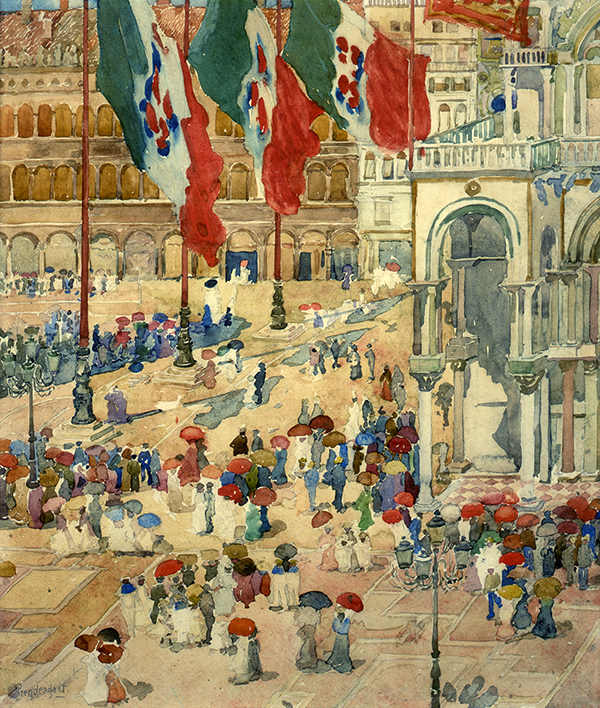 A group of nostalgic, rural scenes by an earlier generation of artists, such as Winslow Homer and Eastman Johnson, as well as by 20th-century figures including Hassam and Willard Metcalf, portrays the other, more retrospective view of the modern experience—the loss of tradition and the wistful recollection of simpler times. Industrialization coincided with rapid urban growth during the mid-19th century, and by the early 20th century rural life was itself an exotic subject for the artists of New York and their equally urban patrons. Pastoral scenes offered them a visual escape. All programs are free and open to the public unless otherwise noted. For a full list of related programming, visit artgallery.yale.edu/calendar. Exhibition organized by Mark D. Mitchell, the Holcombe T. Green Curator of American Paintings and Sculpture. Made possible by the Art Gallery Exhibition and Publication Fund and the Friends of American Arts at Yale Exhibition Fund.